This could be my FIRST serious SEO project. With no or very little knowledge and experience in SEO before, I registered a domain name Baitussalam-Umroh.com on 4 June 2014 under my wife's name. Other website detail can be found on who.is. Back to days before I registered the domain, I have attended a basic internet marketing training held by Al Hikmah BEM with the speakers of Pak Cheriatna and Bu Farida, organized by Pak Erwinsyah (STID DI Al Hikmah). Later Pak M. Taufiq gave another training because he could not attend at the day of first training. I applied the SEO lessons and paid for AdWords PPC service to get more traffic to the website. To reach and understand the visitors, I encouraged to submit articles daily. The article submissions were run daily until two months later which scheduled two or three times a week. I considered this times after found that several articles have been on page 1 and 2 of Google SERP. Researching and re-researching appropriate keywords in the industry. Creating a list of keywords and planning related article for each keyword. Creating good quality articles daily which complied SEO article writing standards according to the targeted keyword..
Optimazing and re-optimazing home page and articles to sit on page one of Google SERP. Submitting the home page to as many as possible of good web directory sites (which were high PR and have relevant category with my targeted website. Submitting the home page to search engines (Google Webmaster Tools, Bing Webmaster, and other many search engine, especially which were Google search partners). Bookmarking home page and selected articles (namely related to main products) to forums, blogs, and other website ethically. Social-bookmarking each new published article to Facebook, Google+, Twitter, etc, hoping many traffics come from the social websites. Regularly fine tuning the keyword list, optimizing related pages, and adding and monitoring backlinks to required pages. To showcase that all of steps above were executed consistently, the effort ends up with the award of FASTEST and 2nd rank in numbers of umrah closings in Baitussalam Umrah and Hajj Services, PT. Papua Tours & Travel by registering via this website. At this writing of article, the omzet resulted by www.Baitussalam-Umroh.com is $135,800, and the trend is increasing! Thanks to my wife that collaborates with me in building our business step-by-step. As per this article writing time, the total page view number of Baitussalam-Umroh.com is 74,373. For its life which is 4 months, so the average monthly page view is 18,593. Should be better for next months. The total backlink number to Baitussalam-Umroh.com is around 2,300. But, the quality of backlinks will be counted by search engine to calculate organic rank while a search phrase executed. The best backlinks are ones that are high PR and relevent to to the website topic or industry. Backlink monitoring is one of continuous work to do as there are inactive or poisoning backlinks that should be aware of. Also, there will be new sites with increased PR and relevant category to link with every day. Fairly, a page ranks well if there is an article supports a related keyword which provided in search process, at minimum. Because the article amount in Baitussalam-Umroh.com is still limited (145 posts at this article writing time), the good ranking keywords are also limited. However, for transactional queries which are long-tail keywords, Baitussalam-Umroh.com performs well. These keywords are but not limited to: umroh desember 2014 (or its variants such as umroh desember 2014 murah and umroh desember 2014 hemat), umroh januari 2015 (or its variants such as umroh januari 2015 murah or umroh hemat januari 2015), and agen umroh murah (and its variants such as agen umroh murah jakarta, agen umroh murah baitussalam, and agen umroh murah baitussalam jakarta), etc. For shorter keywords, there is variation in rangkings. Some rank well and the others don't. For instance, keyphrase baitussalam umroh ranks well while keyphrase agen umroh sits on Google SERP page 2. Other one is keyword umroh. It sat on rank 10 of Google SERP sometime but now it is on rank 20 which is on page 2 of Google SERP. It is said that to be able to sit on page 1, on-page analysis and optimization should be done well, as well as off-page optimization. If a page is on page 1 but at lower ranking, it needs more good quality backlinks to get higher rangking on page 1. Some Baitussalam-Umroh.com pages perform well handling around a hundred keywords. Most of these pages rank between pages 1-2 on Google SERP. Some keywords which are not related to any articles are still out of pages 1-2. This is a job to accomplish. That is all for now. Looking forward to informing you with updated status about this SEO project in the future. Just drop me an email for any question or inquiry about SEO and its related stuff. P.S. : Current www.baitussalam-umroh.com domain has been migrated to www.denahajiumroh.com. 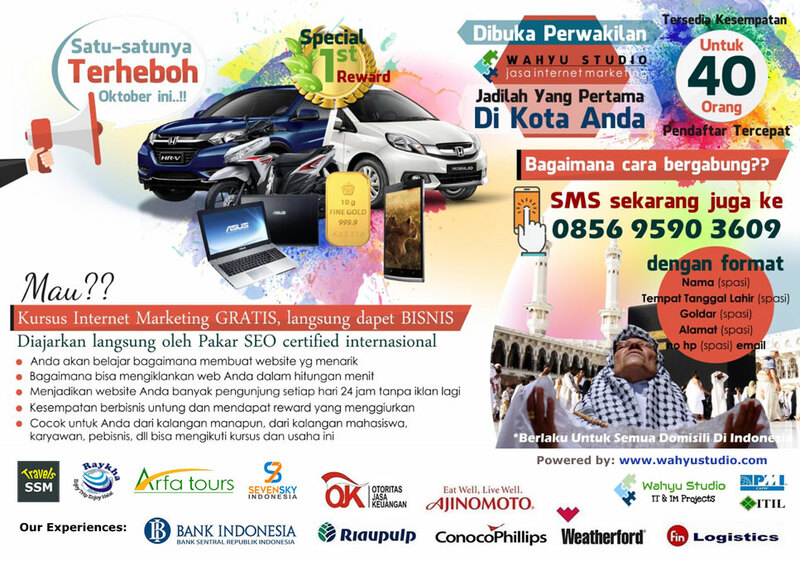 1 Komentar untuk "SEO Project I: www.Baitussalam-Umroh.com"